Dead. "I'm dead." It's a thing we say now, on the internet, when things strike us as being uniquely funny. "I'm so dead," we say. Maybe we don't laugh, but it slays us nonetheless, as jokes have slain people throughout the ages in spite of laughter's reputation for being "the best medicine." "Dying of laughter" is an old idiom and the language of comedy is largely borrowed from the world of violence,mayhem, and harm. Comics "knock us dead." Audiences "bust a gut," and so on. 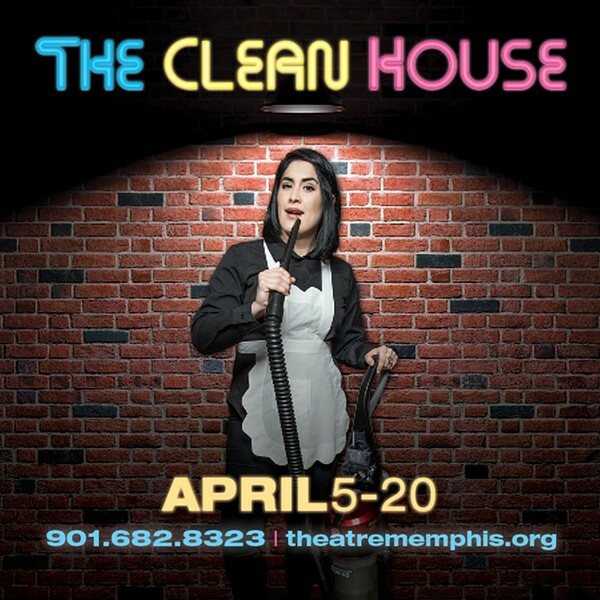 And while I can't say Theatre Memphis' production of Sarah Ruhl's The Clean House "kills," exactly, it may stab you in the heart repeatedly with a scalpel. There's a moment near the top of The Clean House when Lane, a nondescript white doctor in white clothes in her nondescript white-on white-home, tells Matilde the Brazilian maid in her black livery, she's an "interesting person." It's not a complement. The nondescript white doctor, sympathetically revealed by Tamara Wright, didn't hire an interesting person, she hired a cleaning lady who needs to get to work whitening up the grubby space or get another job. Ruhl's heart has never seemed larger than it does in this compassionate piece from 2006, but her metaphors have seldom been more ham-fisted either. Appropriating the kind of magical realism associated with certain strains of South American literature The Clean House essays the relative merits of tidying up. It's themes are Buddhist adjacent, showing how the noblest desire to order a chaotic world results in sadness. It's a sly and deceptively poetic play about embracing the messes we make in the hallway between love and death, and maybe a little self-serving in that regard. It's the kind of work that will likely divide audiences, leaving them delighted and warm on the inside or bored and baffled. Ruhl's work and influence has grown so familiar that her trademark idiosyncrasies barely feel like idiosyncrasies at all. Still, time and quickly evolving perspectives may also make one of the play's more elegantly prepared storylines, a little hard for some to swallow. Lane's husband Charles, who's also a doctor, falls in love with Ana, an older, exotic mastectomy patient. He subsequently undertakes a brutal hero's quest into the arctic to save Ana's life and show the purity of his intentions. Although he's not Jewish, Charles claims personal exoneration from any wrongdoing due to an esoteric Hebrew law regarding soulmates he heard about on NPR, and sincerely wants his jilted (and not having it) wife to rejoice and share in his newfound happiness. Sweetly portrayed by Chris Cotton, Charles is helpless — swept up in an overwhelming love spell he can't understand or control. It suits the play's tone, but tangos at the edge of current sensibilities regarding masculine misbehavior. The show revolves around Matilde, the cleaning lady who's depressed by cleaning. She's also in mourning for her parents, whose perfect love ended badly. Dad was the funniest man in his village in Brazil, and mom was his equal. When she died laughing at one of his jokes he took his own life. Now Matilde wants to be a comedian, and Ruhl's play functions like a preview of some future network sitcom she'll star in. Jaclyn Suffel's formidable in the role, leading us through the dreamy script like a modern day Sabina, the maid, and most memorable character from Thornton Wilder's Skin of Our Teeth. It's a mature, effortlessly commanding turn in a role that often demands the impossible. I'll get back to this in a minute. A lot of The Clean House reminds me of Wilder and Skin of Our Teeth. No dinosaurs come tromping through the theater, but the story's no less magically weird or mythological in its depiction of family, or its focus on origins and eschatology. Only this time, for Ruhl, it's all personal. Matilde's inability to clean is balanced by Virginia's compulsion to straighten, dust, vacuum and organize. Virginia is Lane's sister. She's a damaged soul made of right-sized expectations, and she wants a relationship with her busy, distant sibling so badly enters into a bargain with Matilde to do the depressed maid's work, just to get a toe in the door. Virginia's tragic cheerfulness is stretched to the point of psychopathy, and Aliza Moran walks a tightrope in presenting a deeply silly character who's just a little too fragile to laugh at. It's the show's dilemma in a nutshell. The Clean House's narrative strategy also reminds me, at times, of some of the more vexing routines devised by stand up comic Andy Kaufman who was always more prankster and performance artist than gag-man. It's a show about the power of jokes where all the jokes are whispered or spoken in a language most English speakers won't understand. "It doesn't work in translation," Matilde explains at one point. Honest laughs happen throughout, but the literary force of dangling the play's jokes just beyond reach doesn't translate — and that's okay. Like Kaufman, Ruhl sometimes tests an audience's patience while she's resetting their expectations. This is why Suffel's performance is so key. As the show's narrator, she frames the important stuff, and ushers us through the rough spots even though she's sometimes armed with nothing but a brow crinkle or a little weaponized side-eye. I've got to say, it's nice to see Christina Welford Scott set free, both as Matilde's mother who dies laughing, and as Ana, the "home wrecker," who thinks that sounds like a marvelous way to go. I sometimes think Scott — a local treasure if there ever was one — gets cast in some shows because directors see her in great roles, not because they see great roles in her. That's not to say she doesn't deliver in serious leading parts that call for lots of seriousness and crying. But Scott's capacity for real greatness is most evident when the challenges are physical and fun. Get this woman laughing or clowning or dancing lighter than air and she'll rip your goddamn guts out. Here she's cast as a classic "mysterious" femme fatale, but with a variety of subtle, deeply satisfying twists. Her death (not a spoiler) is full of life, and hung all around with joy and agony. I have a mixed relationship with The Clean House. I get tired of both its sense and its nonsense for long stretches. But the more I think about its individual parts, the more I find to recommend about the whole complicated dust bunny of a play — this morbid joke built on sixes not threes. So, I'm throwing caution away, embracing my messy feelings, and calling it a win for everybody involved. Well, everybody except for the poor guy snoozing on the front row. Or maybe he was just dead?